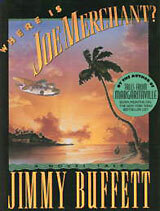 Book review: "Where Is Joe Merchant?" Many people wondered if rock star Jimmy Buffett could follow up his best-selling "Tales From Margaritaville" with anything else of substance. While "Margaritaville"  a collection of short stories  was as popular with critics as with readers, those wary of a rock star as author thought (perhaps hoped) that he had shot his wad. But "Where Is Joe Merchant? ", Buffett's first novel, is a timeless book, existing in a special universe peopled with characters as eccentric (if more contemporary) as those found in old Bogart movies and Chandler novels. It is perhaps not as strong as the best entries in "Margaritaville," but is more rewarding in other areas  such as character development and location description, two real strengths here. Buffett's characters are believable and consistent; even when the characters take surprising action, it is based on plot and history, not on sudden-onset psychoses. The protagonists are likeable; the antagonists evil. There's something comforting about good guys who are good and bad guys who are bad. While plot development isn't as strong as the character and locale, the story is passable enough. Rock star Joe Merchant, supposedly dead for five years, keeps being "sighted" more often than Elvis or JFK in the National Enquirer. Frank Bama's girlfriend is Joe's sister, and she's convinced he's alive  so Frank helps her, along with a cast of true characters, both friendly and hostile. And Buffett offers up a surprise ending O. Henry would have approved of. Most of all, though, Buffett is a romantic at heart. The first bit of evidence to this is the fact that Frank flies the same boat Buffett himself flies  a Grumman Goose. And Bama himself  narrator and presumed stand-in for Buffett  is an incurable romantic who believes love can conquer anything, that there's magic in flying, and that friendship is the most important commodity in life. It's this overriding sense of romance that gives "Joe Merchant" it's timeless charm. If there's a complaint, it's the New Age tone that permeates too much of the book. It detracts from the impact of the book, giving it a bit of a yuppie aroma that intrudes on the otherwise counter-cultural atmosphere. But that's a petty quibble over what's a very enjoyable book by a very literary author.